Size: 100 * 98 * 32 MM / 3.86 x 3.94 x 1.26 inch. Using classical tube 6j1 design optimizes the route and provide soft clear sound. The tubes could be replaced. This being a hybrid. With treble and bass adjustment function. This is a Pre-Amplifier. You need to connect with power amplifier for using. It can match digital power amplifier, analog power amplifier, active speakers.Not suitable for turntable phono. It is suggested to choose a more advanced pre-amplifier to match your high-configuration amplifier. Please make sure to connect the power amplifier firstly for the connection and turn on the preamplifier firstly when use. If there is any problem about the product, please contact the seller first for support. ►HIGH QUALITY MATERIAL - All aluminum alloy shell, heavy gold PCB, gold-plated interface. ► PATENT POWER CONVERSION MODULE - The first preamp with 12V power supply. ► CLASSIC 6J1 TUBE - This design optimizes the route and provide soft clear sound. This being a hybrid. ►WITH TREBLE AND BASS ADJUSTMENT FUNTION - It can match digital power amplifier, analog power amplifier, active speakers. ► NOTICE - This is a Pre-Amplifier. You need to connect with power amplifier for using. Not suitable for turntable phono. 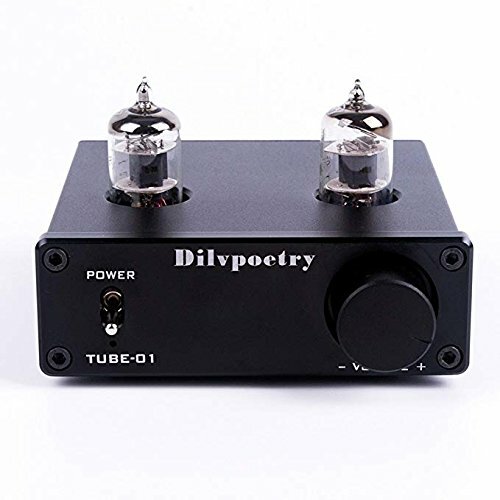 If you have any questions about this product by Dilvpoetry, contact us by completing and submitting the form below. If you are looking for a specif part number, please include it with your message.